October is Annual Meeting month and our President, Kate Dilks, welcomed 48 members on October 12th, which Kate had discovered, was Cornish Pasty Day in Brazil. Apologies from members unable to attend were read out, the coffee hostesses were thanked, and Hortense Oates was thanked for the flower arrangement. The report of the last meeting was approved and signed. The Christmas lunch is at Lympne Castle on December 4th and all monies must be paid at the November meeting. 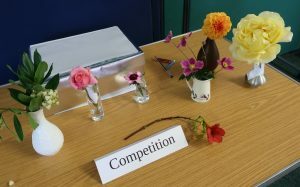 This month’s competition ‘a flower from your garden’ proved popular with members. The winner with the beautiful orange dahlia was Gill Chapman. Another important date for diaries; on Friday November 23rd at 12 noon we will be holding one of our famous Soup Lunches at a cost of £4.00 per person. Tickets will be available at the November meeting. For more details click here. We then moved on to the Annual Meeting. The Financial report was presented by Lynda Daly and was adopted by the members. Lynda was thanked for her work as Treasurer. Daphne Gazeley presented the committee’s annual report which showed once again what an active Institute we are and Kate Dilks gave the President’s report. There was only 1 new nominee for the committee and so Dee Mackay-Pocock was co-opted to serve with existing members. Kate Dilks agreed to serve another year as President. Hilary Kirkby was presented with a bouquet and thanked for helping to collect the East Kent News each month from “head office” which is now at Pean Hill, Whitstable. For details of next month’s meeting please click here.